The deserts in Northern Africa, Arabia and the Middle East, while a feral population is also to be found in the Simpson Desert of Australia. The smooth coat is beige to light brown in colour with the undersides slightly lighter. Some individuals can vary from white to dark brown. The legs are long and slender, with callouses on the knees where they touch the ground when lying down. They have a singular hump on their back. The upper lip is deeply split and the nostrils can be closed. Long eyelashes keep sand out of the eyes. The two broad toes on the feet are able to spread widely as an adaptation to walking on sand. Overall body length can measure up to 300cm. They can stand up to 210cm in height and weigh up to 1000kgs. Group structure: Feral herds of females and young led by an adult male, generally with fewer than 21 individuals. Other males form bachelor groups. Diet: Leaves, grasses and thorny desert plants. Sexual Maturity: Females at 3 – 4 years. Males at 5 – 6 years. Gestation Period: 12 -13 months with 1 young born. Camels can survive long periods without water and when water is available they can drink up to 57ltr at any one time. Males can extrude their soft palate, which hangs out of the side of their mouth like a red balloon when excited. Camel’s have ferocious looking teeth with large incisors that direct backwards which gives them the ability to scalp skin off a persons head. Camels will usually spit when aggravated. 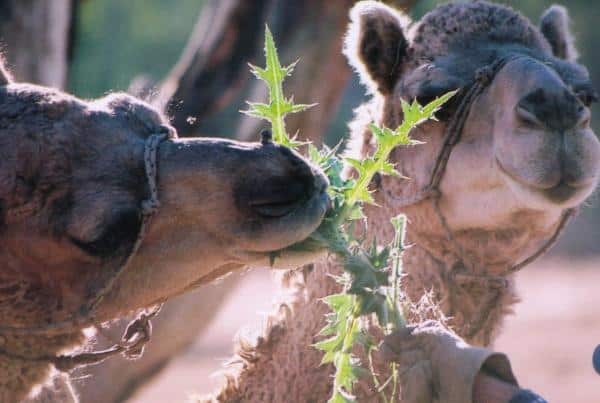 Camels have a leathery mouth and split upper lip to help them eat prickly trees and shrubs. 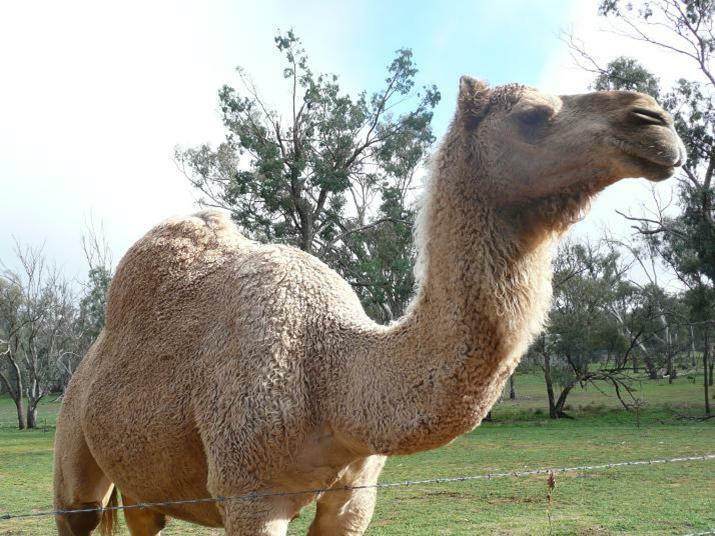 The hump is a fat reserve rather than a water storage used for when food is scarce, the larger a Camel’s hump the healthier the animal.